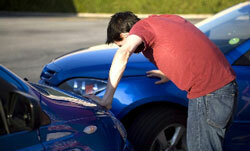 A Fort Worth auto injury is a vital reason to seek Fort Worth chiropractic care. Even if no back pain, neck pain, migraine, headache or other Ft. Worth auto injury symptoms are immediately apparent following the accident, damage could have been done to the neck and spine. Back to Health Family Chiropractic can evaluate and diagnose any spinal misalignments and inconsistencies that may have resulted from an auto accident injury. Our Fort Worth chiropractor can then assess which of our auto accident injury treatments will be most effective and beneficial for each particular patient. We offer some of the most advanced chiropractic treatments, including the Atlas Orthogonal Adjusting technique, and treat a wide range of conditions caused by spinal issues and auto injuries. The common Ft. Worth auto injury of whiplash is caused by the violent and sudden motion of the head being thrust in any direction. Immediate symptoms often include neck pain, headache, migraine and back pain although, if left untreated, more severe conditions can develop, such as sciatica, abnormal blood pressure and Fibromyalgia. Neck pain and back pain are also common following a Ft. Worth auto injury, often a result of a misaligned spine or vertebra being jolted out of place. Pain is an immediate indication that something is wrong and needs attention from our chiropractor. As if the pain is not bad enough, leaving a misaligned spine untreated can again result in more serious issues, such as sciatica, chronic headache, severe migraine and other painful and debilitating conditions. Many Fort Worth auto injuries include a misalignment of the Atlas vertebra, which is the topmost cervical vertebra that supports the head. The 3-ounce bone has a tough enough job regularly supporting the head, which typically weighs between 9 and 17 pounds, but its job becomes even tougher when the bone is jostled out of place. Our Fort Worth office has the only Board Certified Atlas Orthogonal Chiropractor in North Texas, who focuses on the re-alignment of the Atlas vertebra. Dr. Michlin employs the Atlas Orthogonal Adjusting Instrument, a gentle, percussion instrument specifically designed to guide the Atlas vertebra into place. If the Atlas vertebra remains out of place, the misalignment can cause the entire spine to mis-align. This puts pressure on the spinal nerves that can cause headaches, migraine, neck pain and back pain as well as forces the body to compensate for the misalignment, often resulting in sciatica, blood pressure abnormalities, or the appearance of one leg being shorter than the other. Other treatments we offer for Fort Worth auto injuries include full spinal adjustments, spinal decompression, Cox Flection Distraction and soft tissue percussion; treatments that can help spinal issues brought about by any cause, such as fibromyalgia. To find out more or to schedule a consultation, call us at 817.810.9111 today.